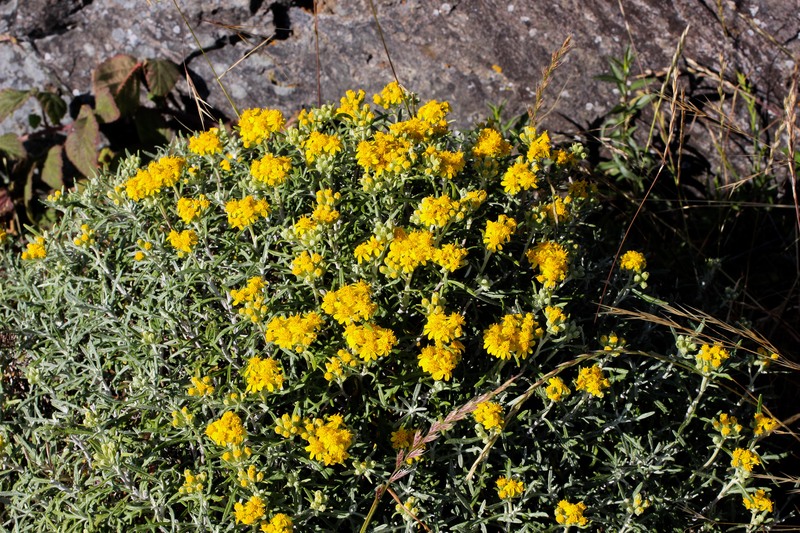 A low, mounded bush clings to a rocky seaside hill–covered in yellow flowers. This is lizard tail (Eriophyllum staechadifolium). Abundant flowers grow in dense clusters. Each daisylike bloom sports 6-9 “petals” or ray flowers–or else no ray flowers at all. The whole bush seems tinted gray by a wooly coating of small hairs; perhaps the color lends the name since the shape of the narrow, forked leaves don’t resemble a lizard’s tail at all. 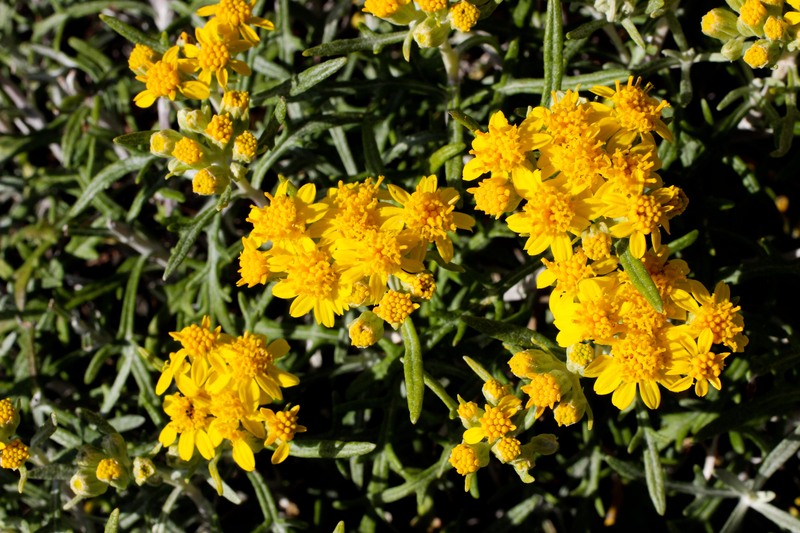 This California endemic is rewarding because it some plants put out a few flowers even in the off-season, adding a splash of color to fall or winter hikes (though its main blooming season is in the spring). Look for it along the coast throughout most of the state. It has a few close cousins in our area, namely wooly daisy and golden yarrow–but the first grows each yellow daisy on a single stalk, while the second is mainly found inland (and has fewer petals). This humble little plant really grows on you (pun intended). Although, as the article mentions, it doesn’t seem to resemble a lizard tail or any other part, kids go nuts over it for the name alone. The mound of grayish, crinkly leaves adds a nice texture where planted. Once established, it’s very responsive to even severe pruning. And when it blooms, the masses of little flowers just lights up the whole area. When blossoms are finally faded, at shear off at least the spent flower stems. But you can also use the opportunity to prune for shape. I’m working on shaping one as a topiary, and also highly recommend it for use as a low hedge/border. Pollinators LOVE this plant and will fill your garden with lively zooming while it’s in bloom. Good sun, ventilation and drainage are needed. Apparently it’s common name “Lizard Tail” refers to how fast a stem or branch regrows when broken off. A lizard’s tail can be regrown if they get bit off or whatever.